WHEN Nev and Shirley Austen were 18 and 20 years of age, they hired a boat with a group of friends and went to Moleville Rocks. Shirley remembers all the women were to cook something. "I couldn't cook so I brought scones," she said. "But they were so hard the boys threw them up in the air and shot them." 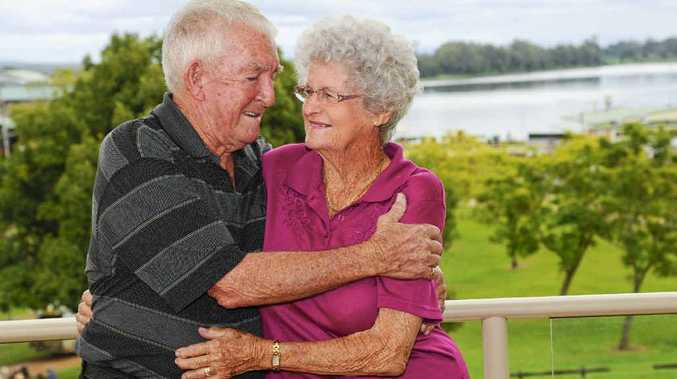 Sitting on the veranda of their South Grafton home yesterday as they prepare to celebrate their 60th wedding anniversary, they looked out over the same river on which Nev fell for Shirley in 1952. "I knew she was the right partner for me," Nev said, admitting he had some work to do before Shirley agreed to marry him. The pair will mark their anniversary at the weekend and Nev said he thinks the secret of their success is they've always "remained as one". They worked with logging trucks and Nev managed a mine near Glen Innes while Shirley worked in a clothing factory and at the telephone exchange. With two daughters, four grandchildren and seven great grandchildren, this weekend's celebration is set to be a big one.